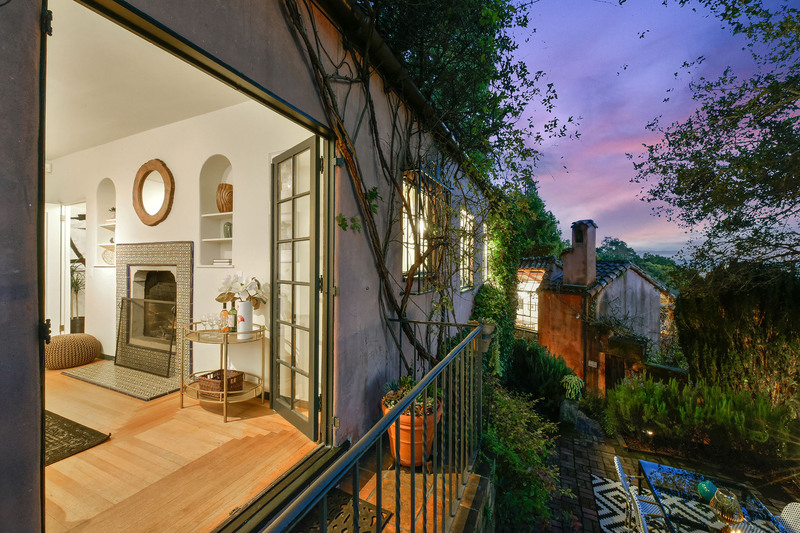 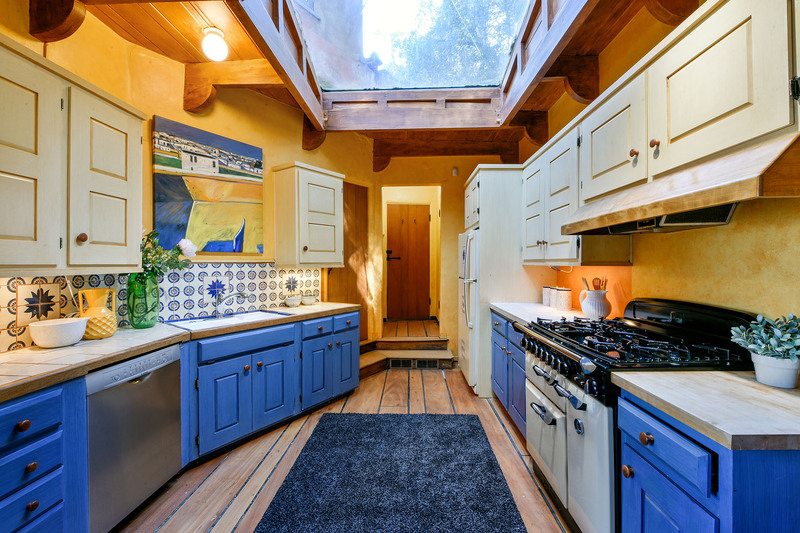 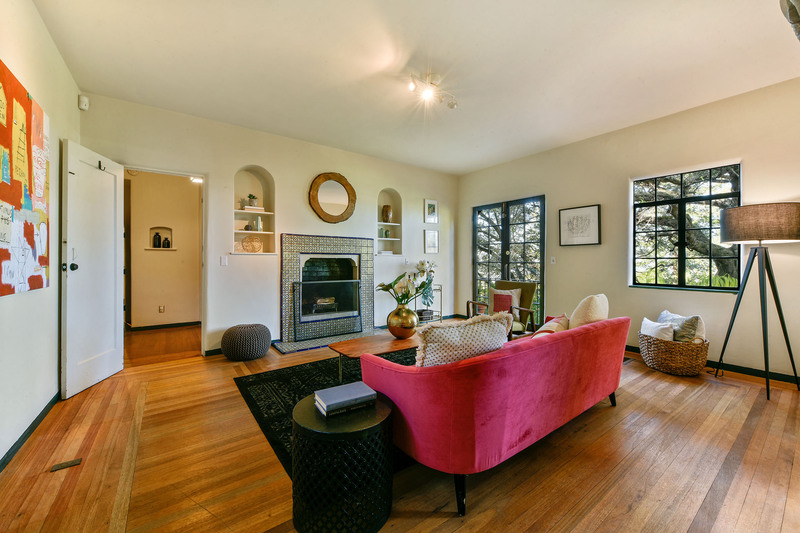 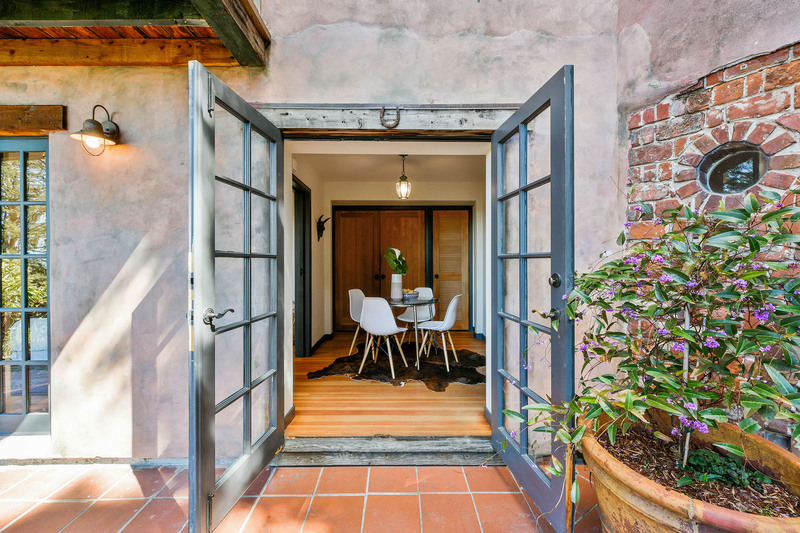 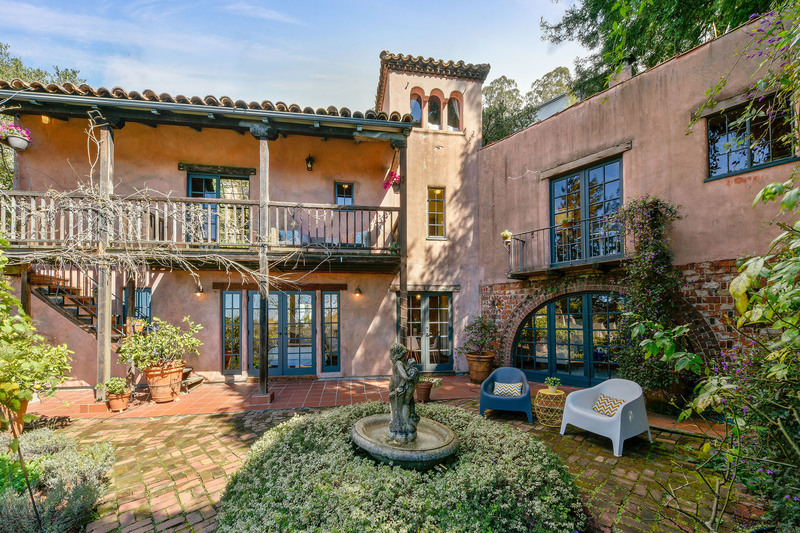 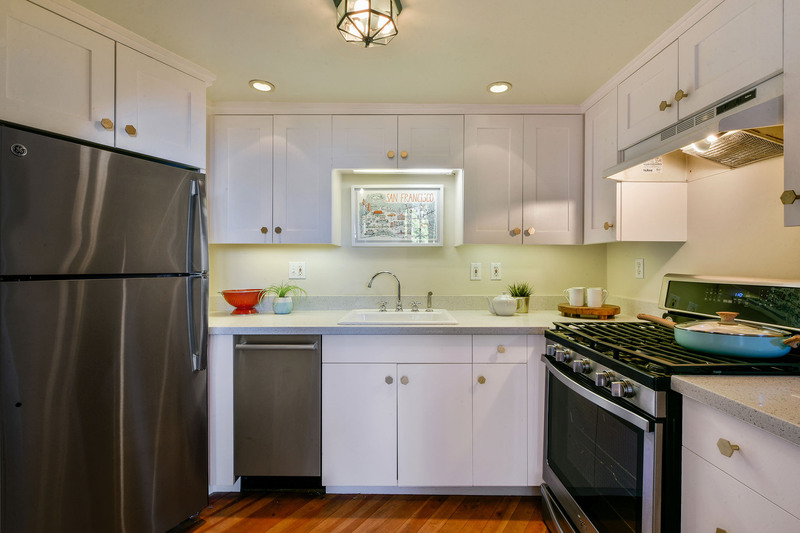 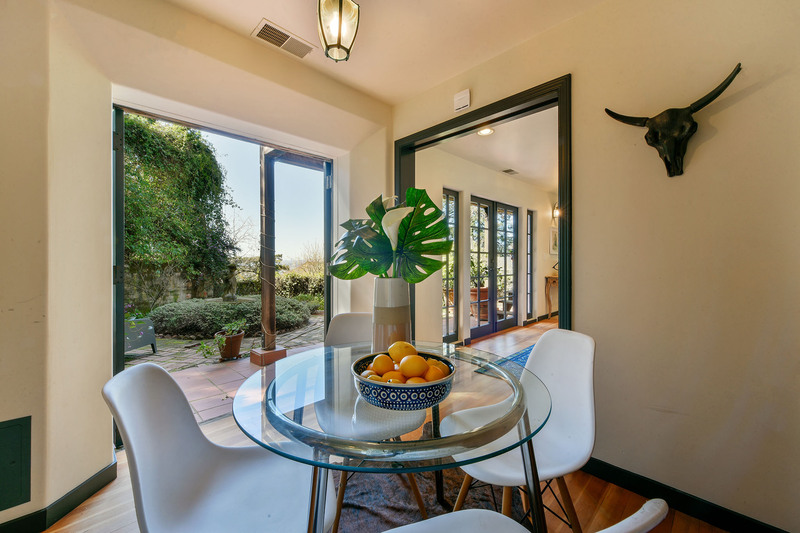 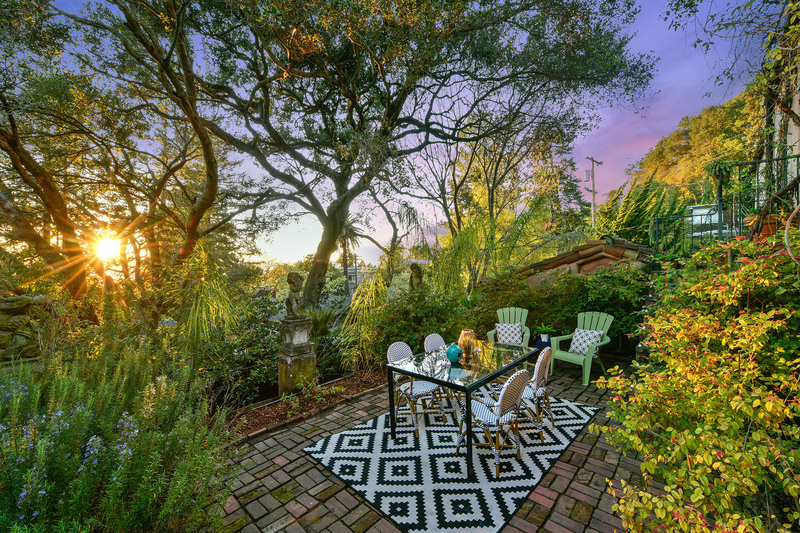 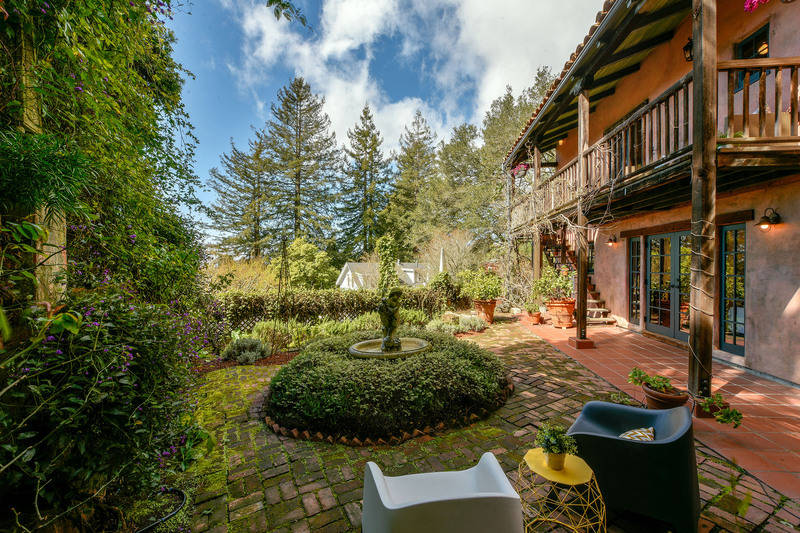 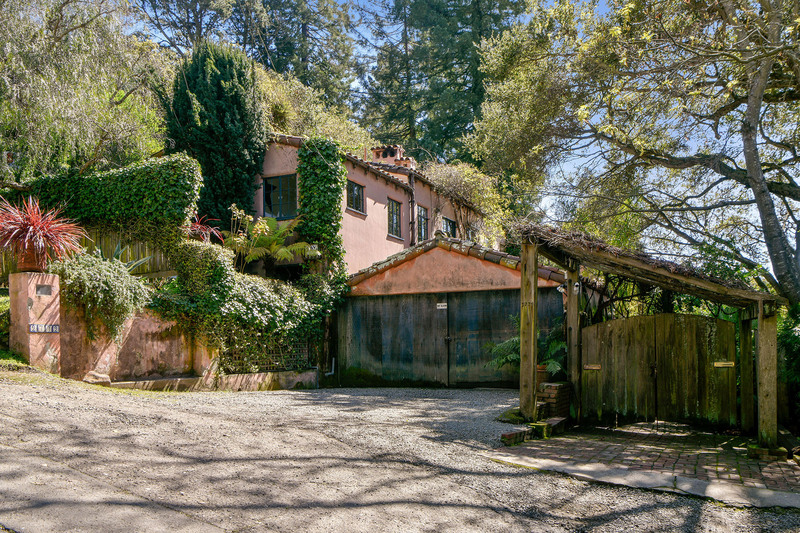 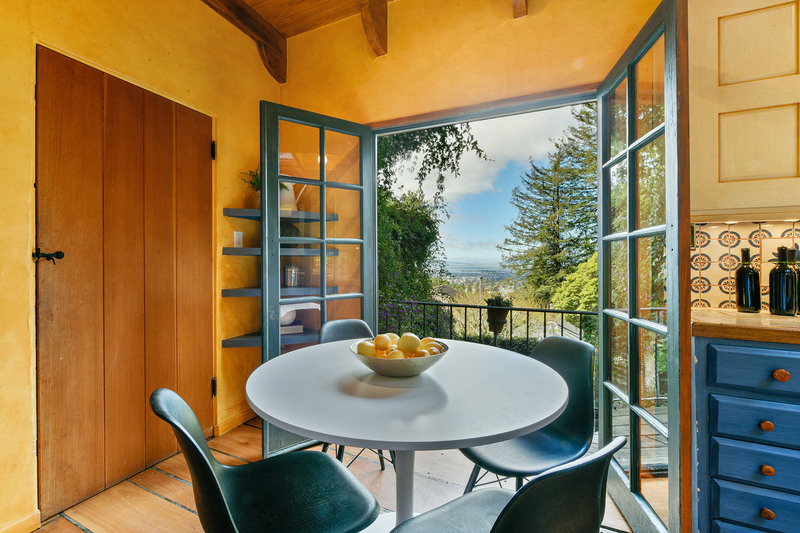 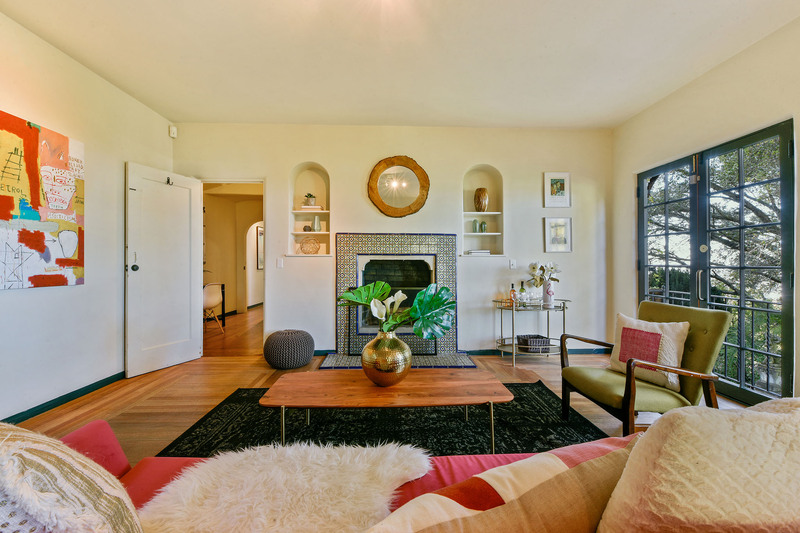 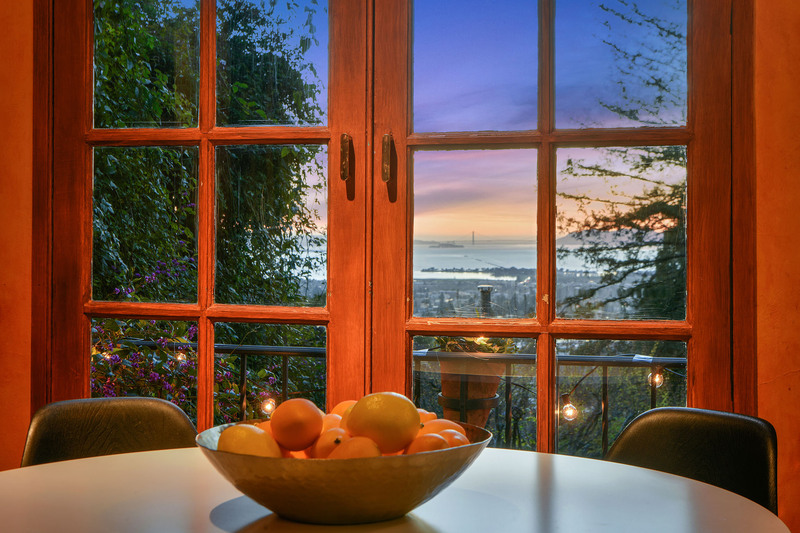 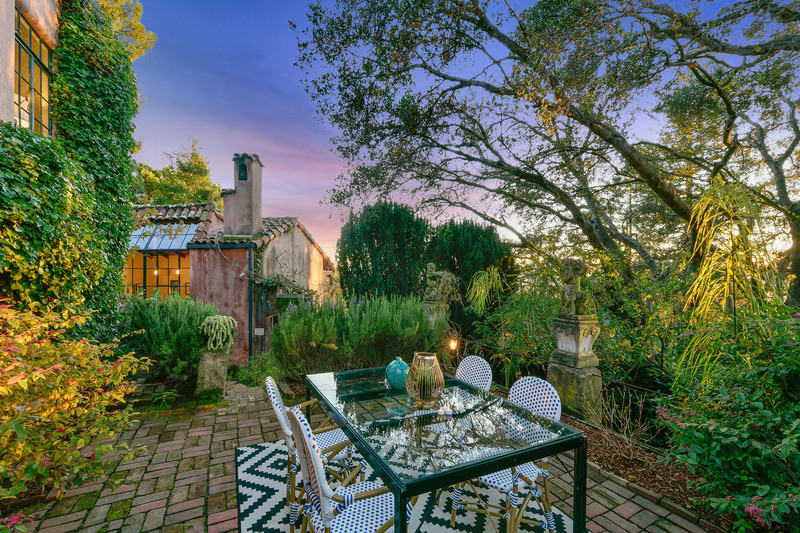 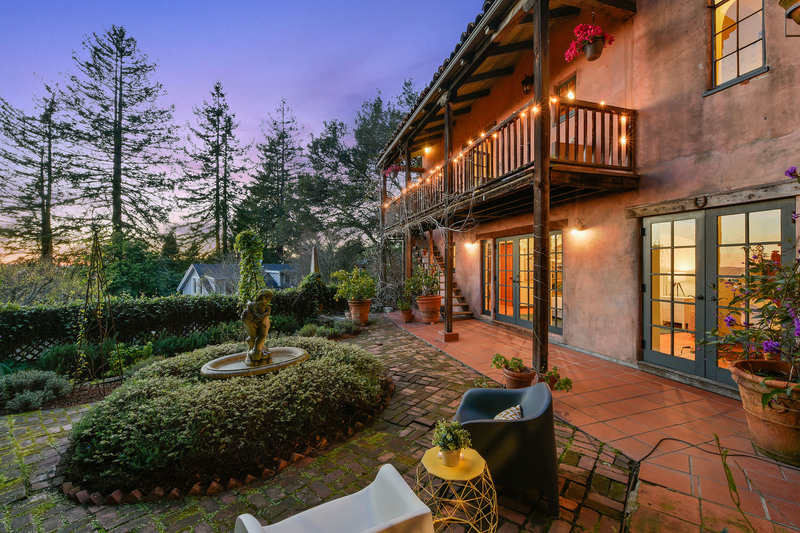 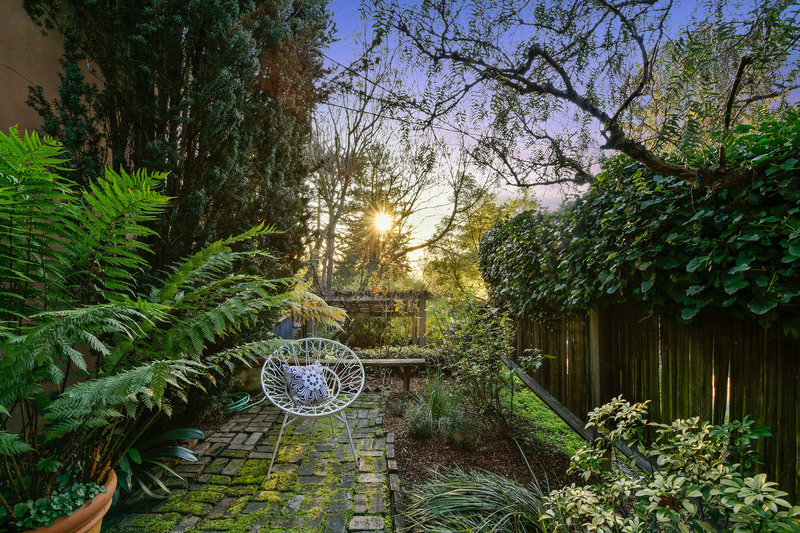 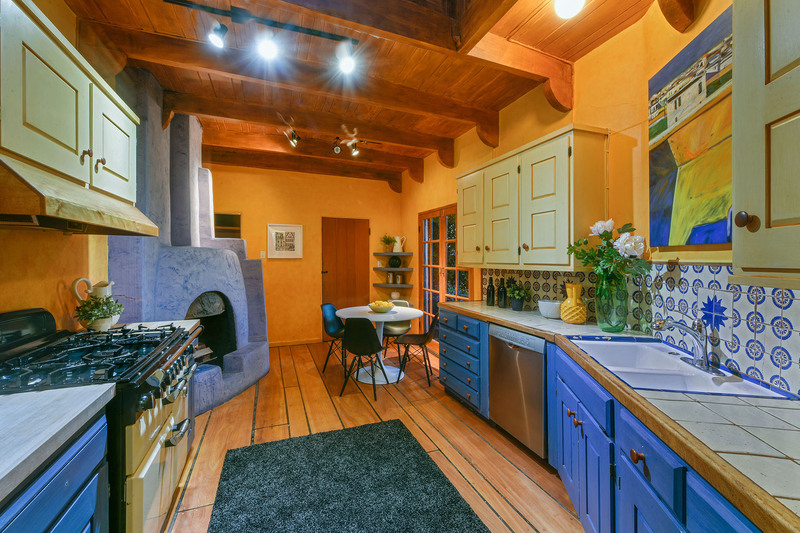 2772 Hilgard Avenue is an utterly charming 3+BD/4BA Berkeley home ideally located on a private cul-de-sac steps from UC Berkeley and distinguished by a European sensibility and a versatile, compound layout. 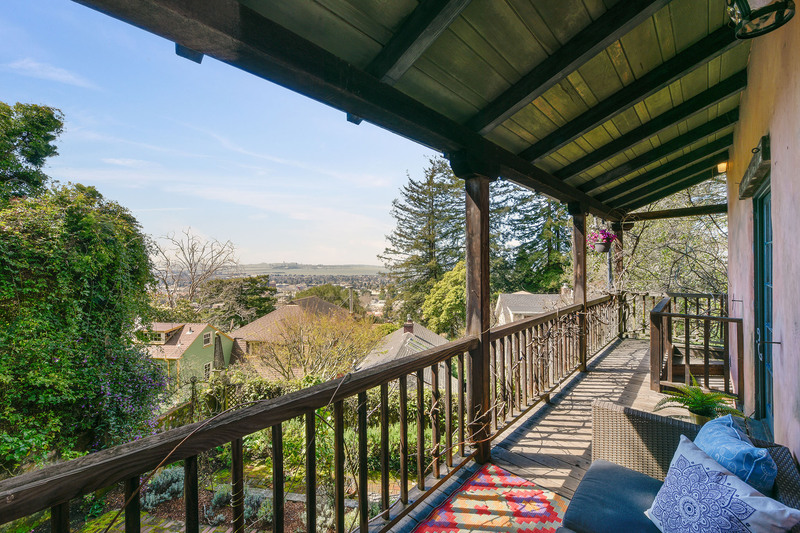 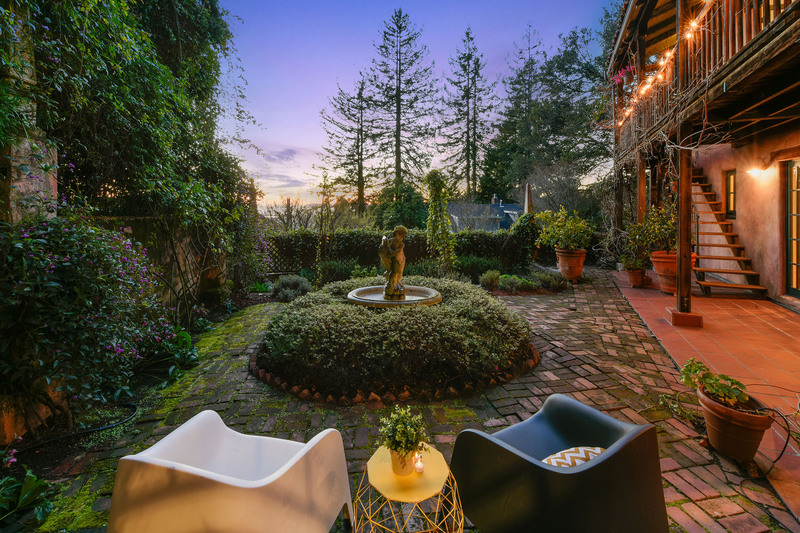 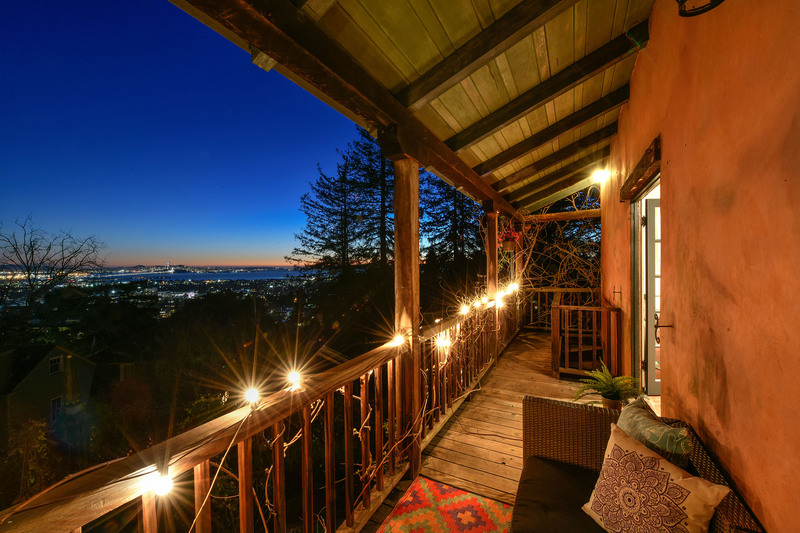 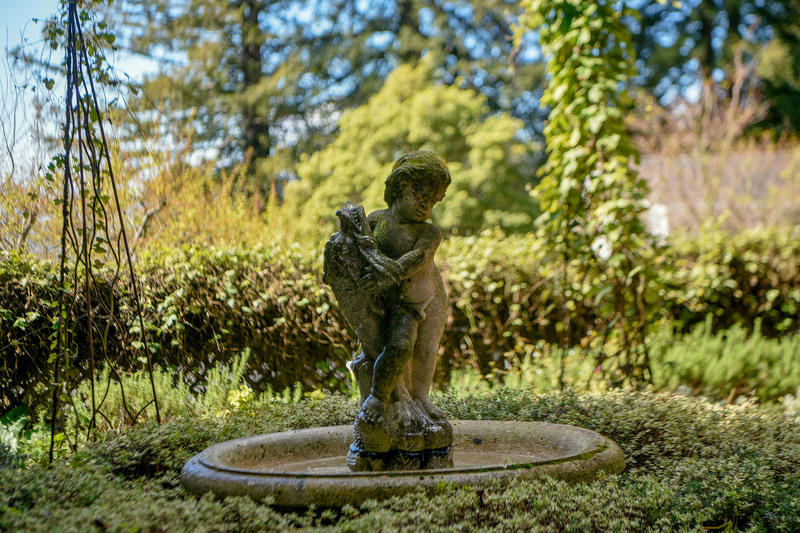 Graced by mature gardens and featuring a main home plus two additional one-bedroom apartments, as well as spectacular views, 2772 Hilgard reveals one delightful, romantic surprise after another. 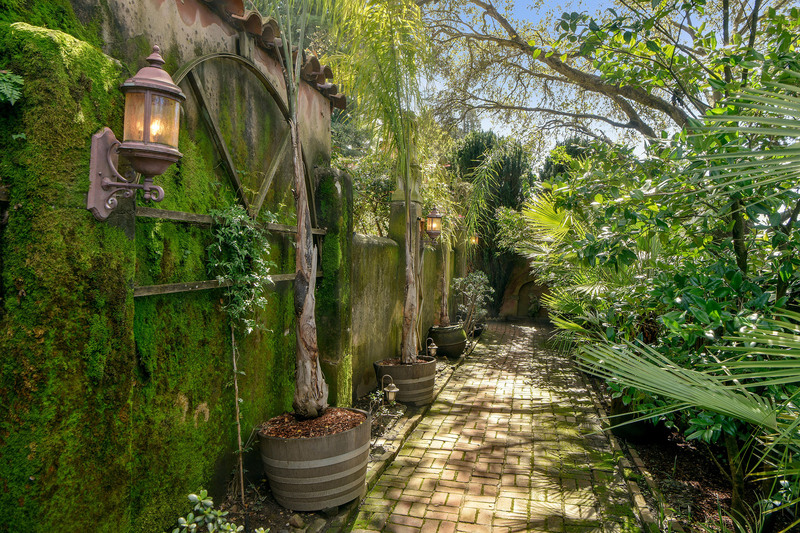 The moment you approach this incredible 3,087 square foot home, its European villa aesthetic reveals itself: you wend your way down a brick path shaded by arbors and terraced gardens, and as you enter the main home, you are drawn to its gorgeous common living/dining area, which features vaulted ceilings, a remarkable and expansive greenhouse picture window overlooking the front garden, a terra cotta tile floor, an enchanting stucco fireplace, and French doors leading to one of the home’s most distinctive features: a rustic balcony overlooking the home’s enchanting rear garden, with dramatic views of the Campanile, the bay, San Francisco, Oakland, the Golden Gate Bridge, and the east span of the Bay Bridge. 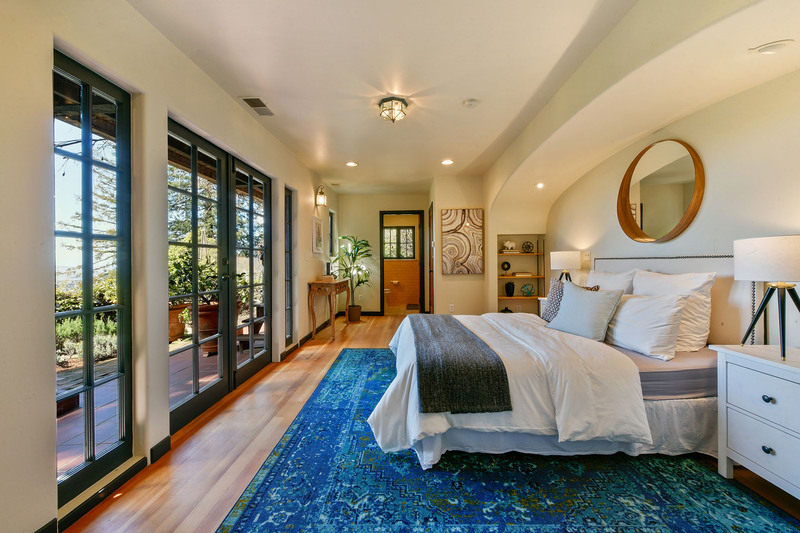 Tucked to one side of the living room is an alluring spiral staircase; at its top is an inviting sleeping alcove where you can take in still more of the amazing view through arched leaded glass windows. 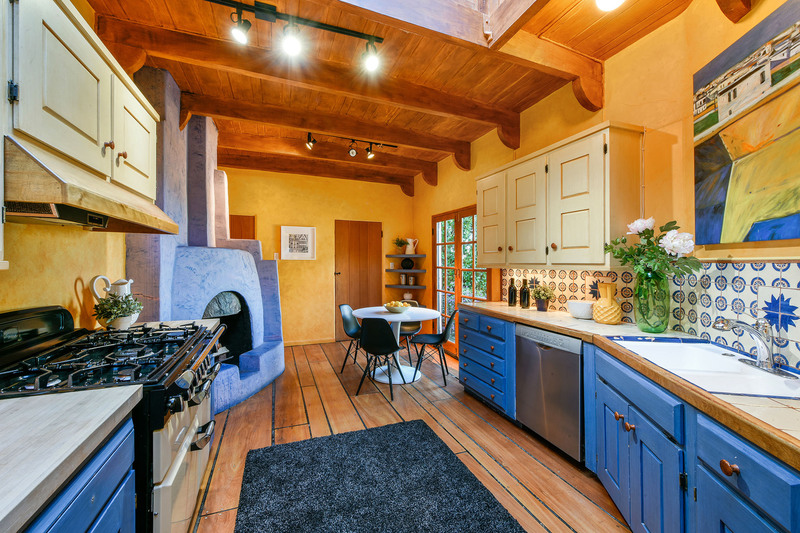 The eat-in chef’s kitchen at 2772 Hilgard is distinctive and welcoming, with a stucco wood burning fireplace echoing that in the living area, a five-burner AGA gas range with double oven and warmer, and ceramic tile backsplash, all lit by an incredible vaulted skylight and accented by exposed beams. 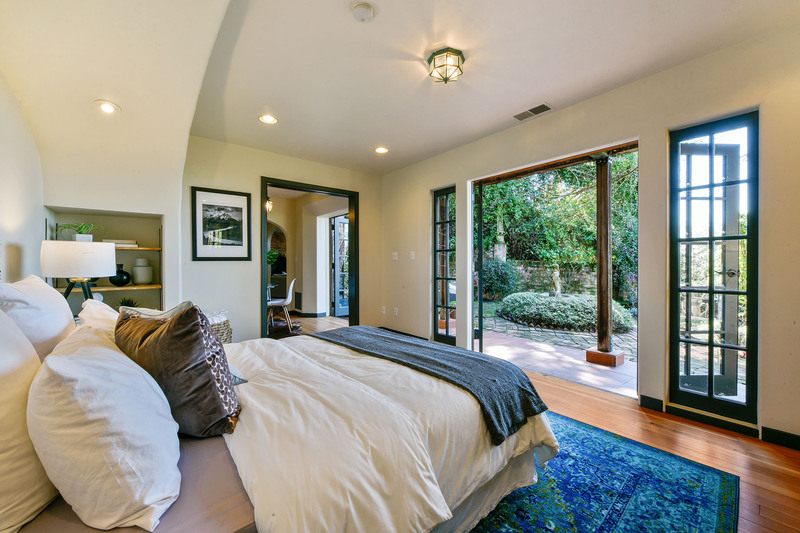 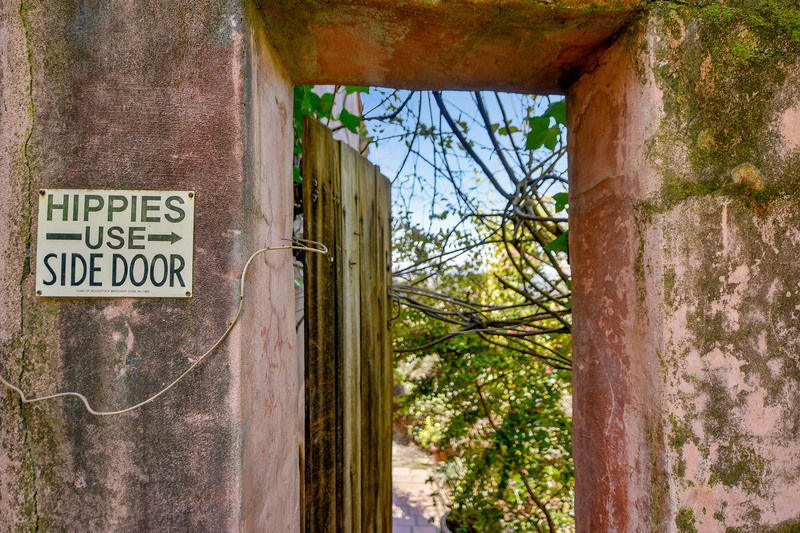 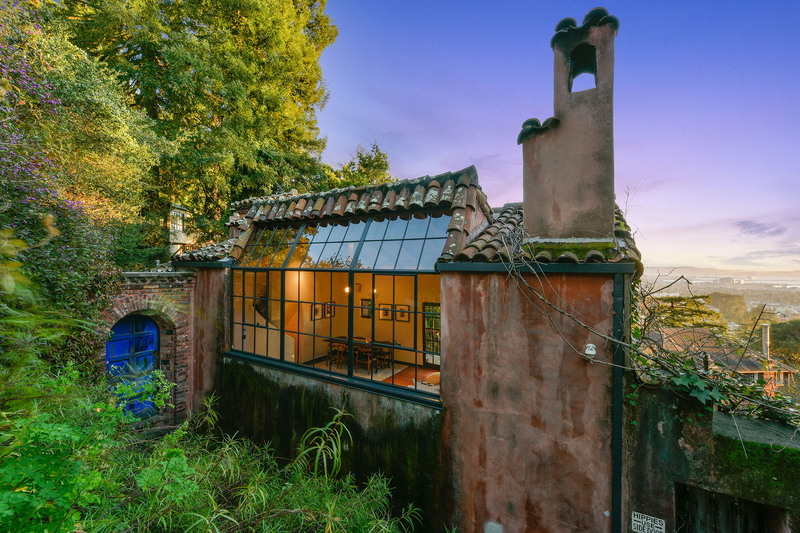 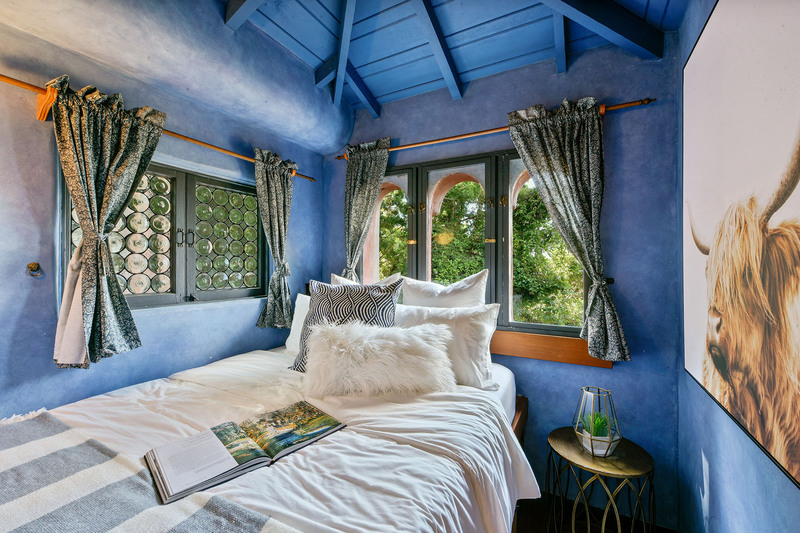 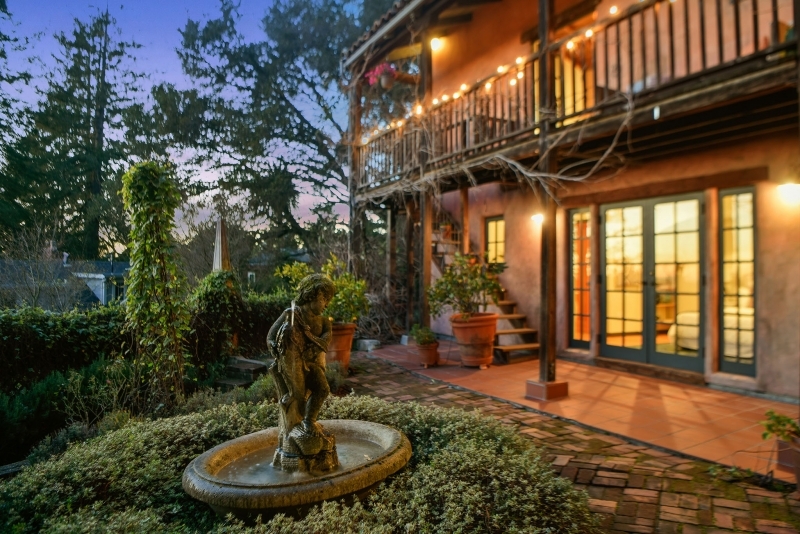 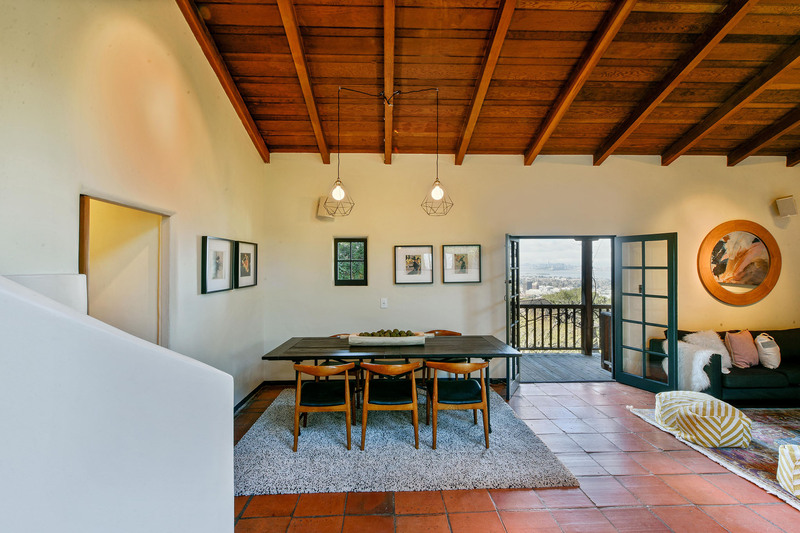 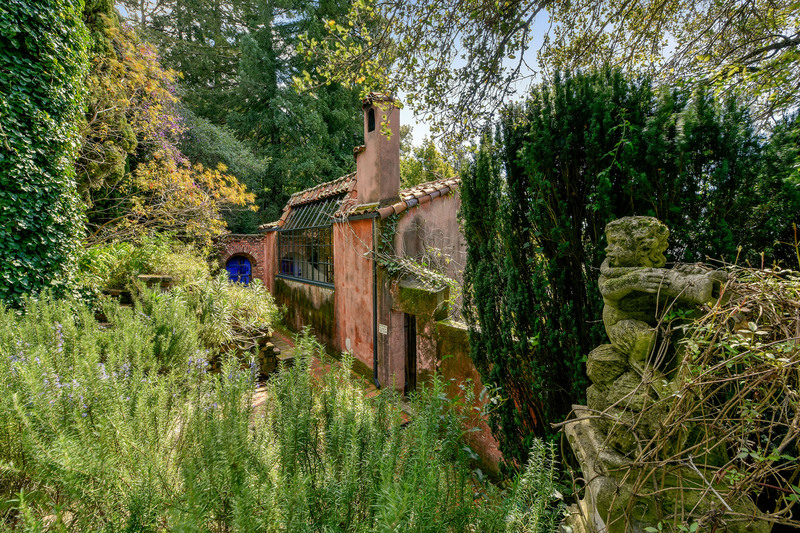 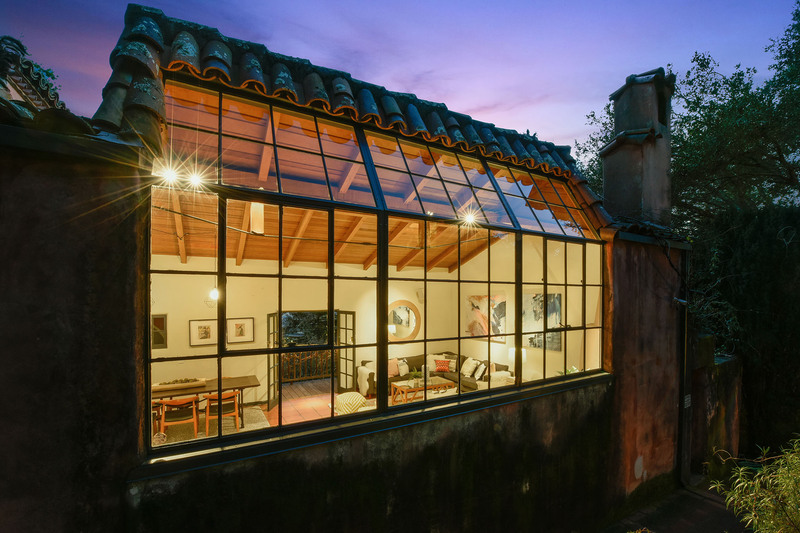 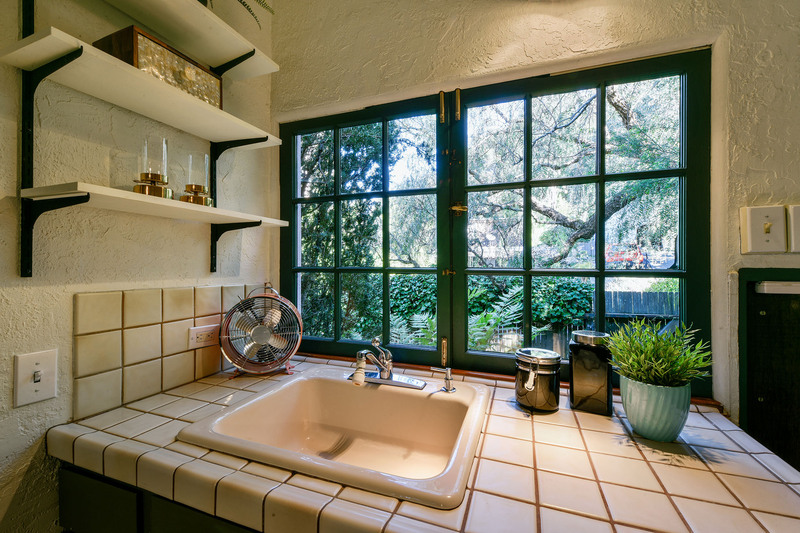 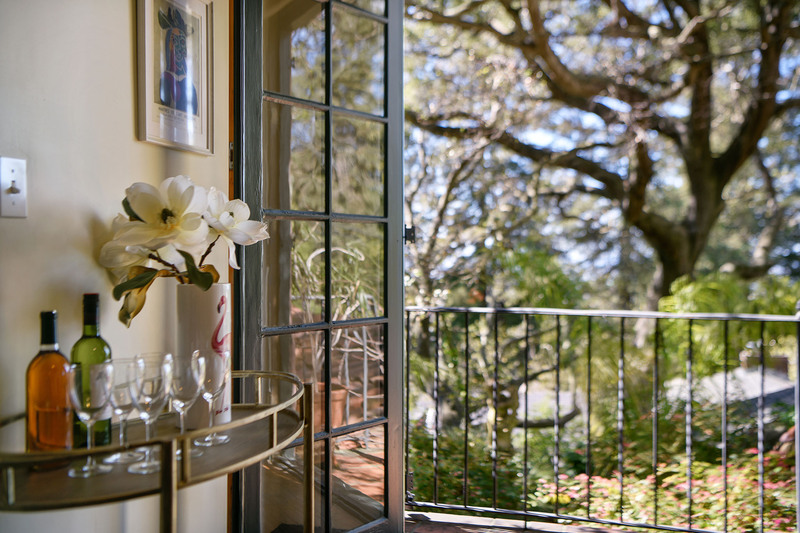 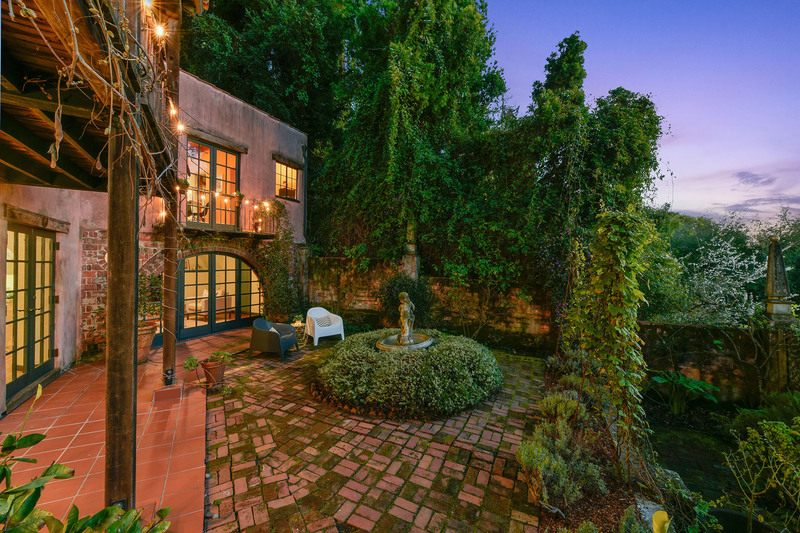 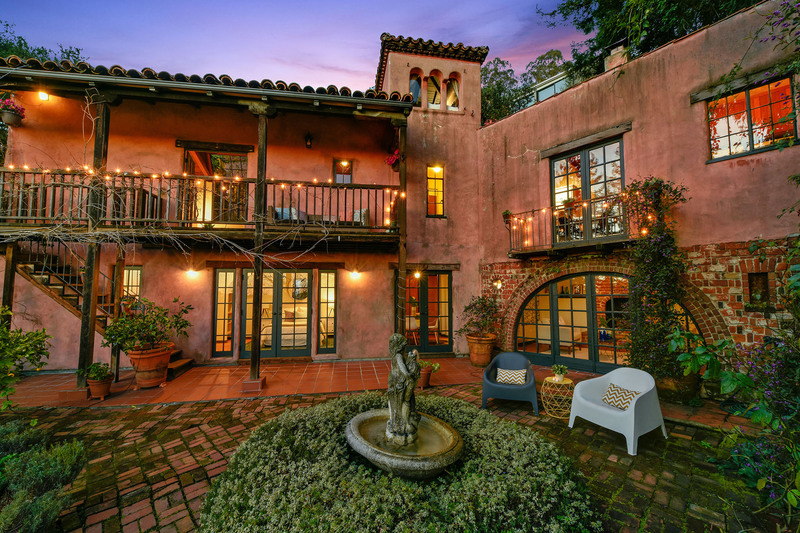 Through French doors, the home’s romantic balcony overlooking the garden is also accessible. 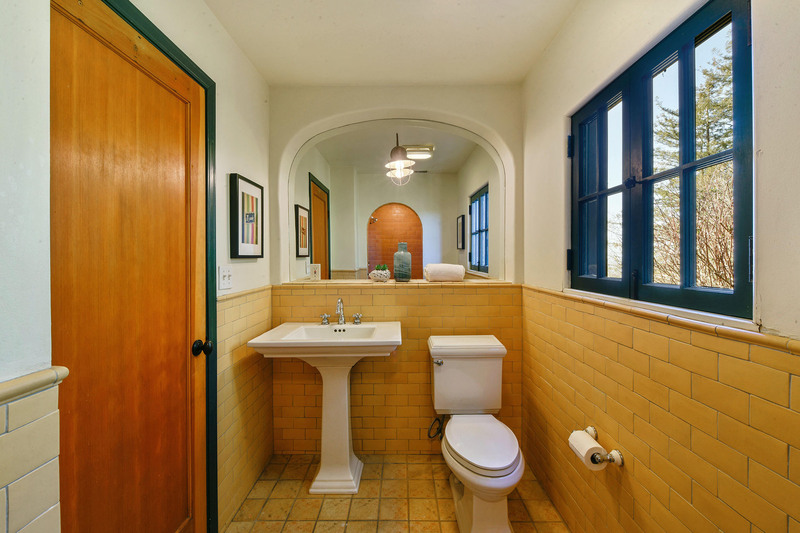 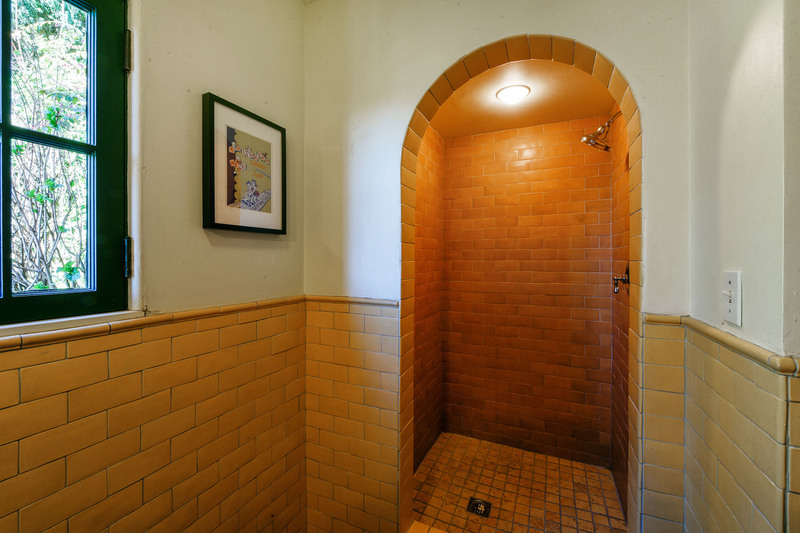 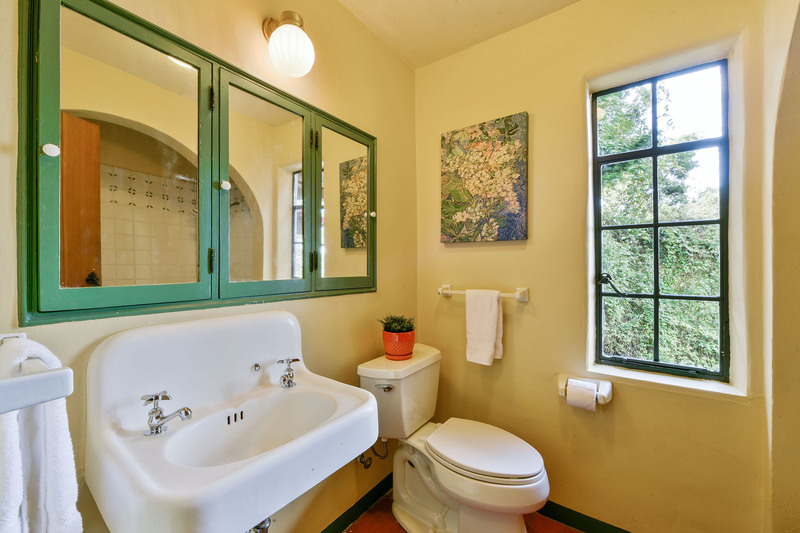 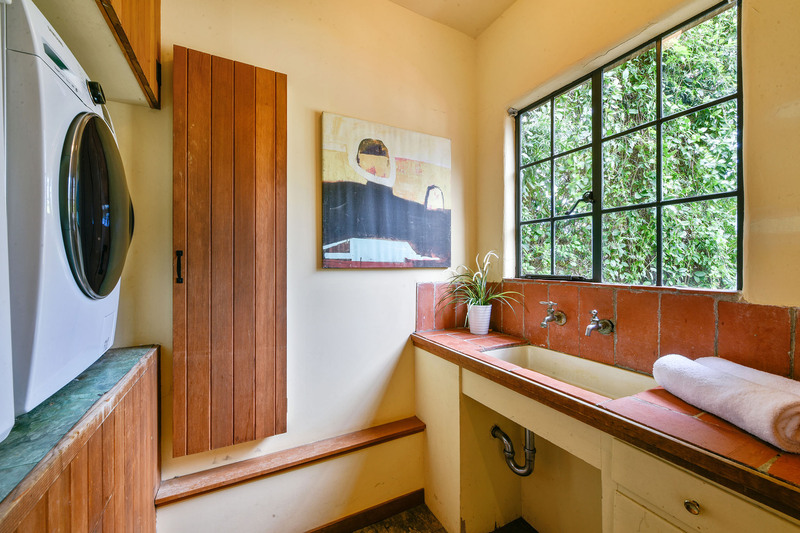 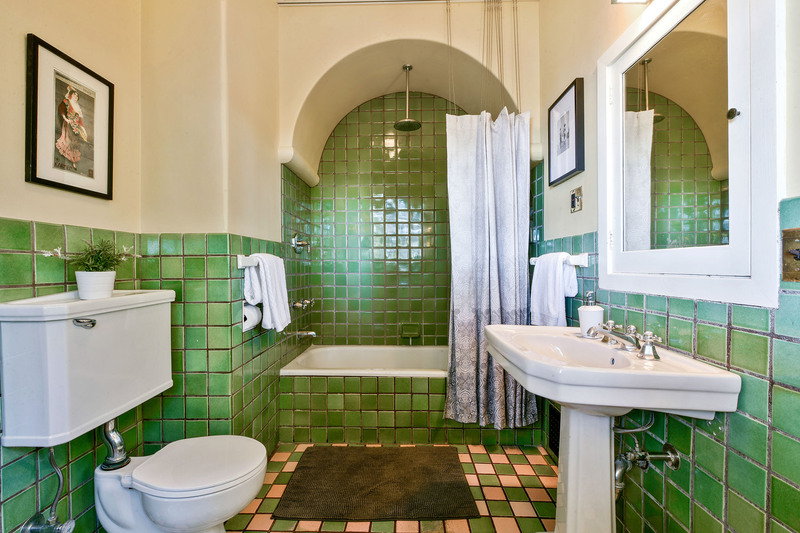 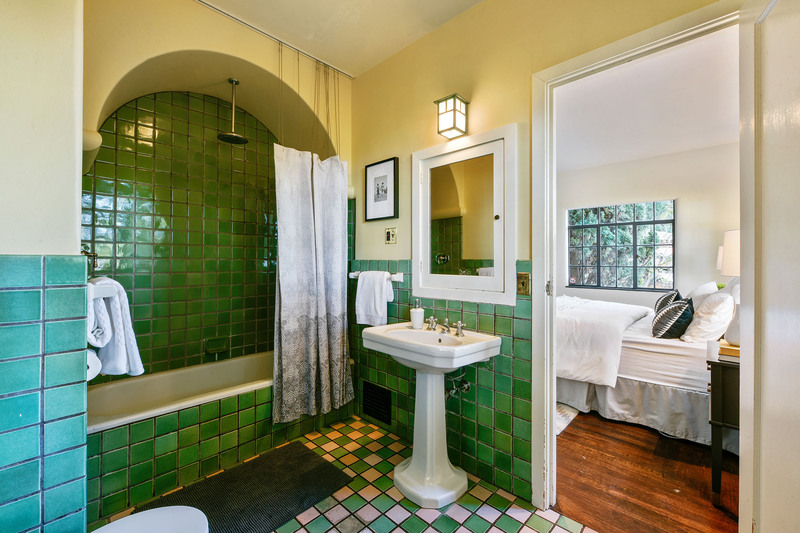 Also on this level of the home is a hallway bath with terra cotta tile and a shower over tub, and off the kitchen, a laundry area with utility sink and cabinets. 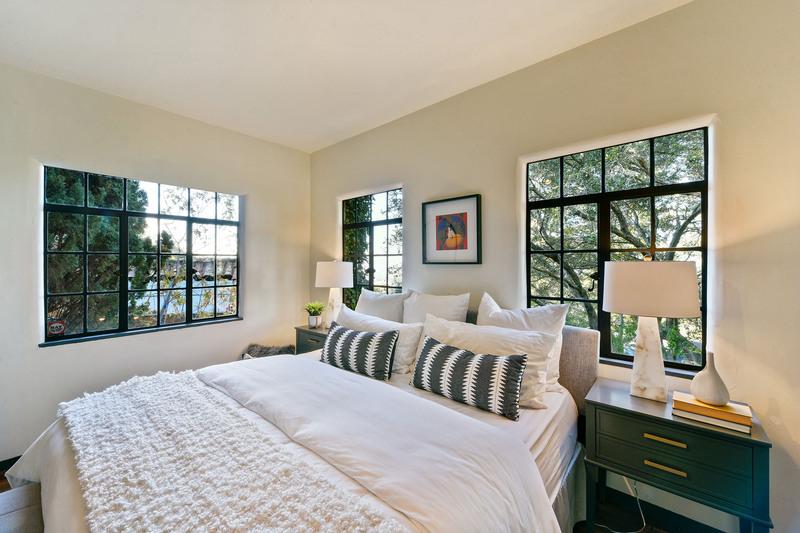 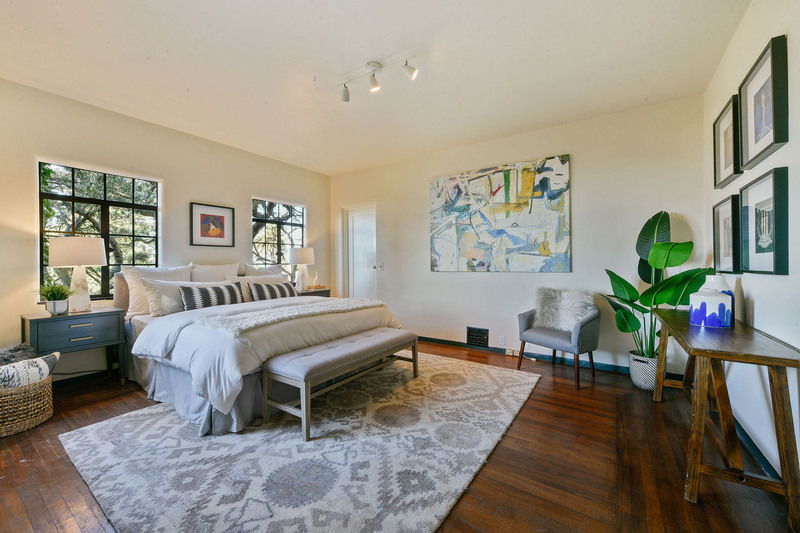 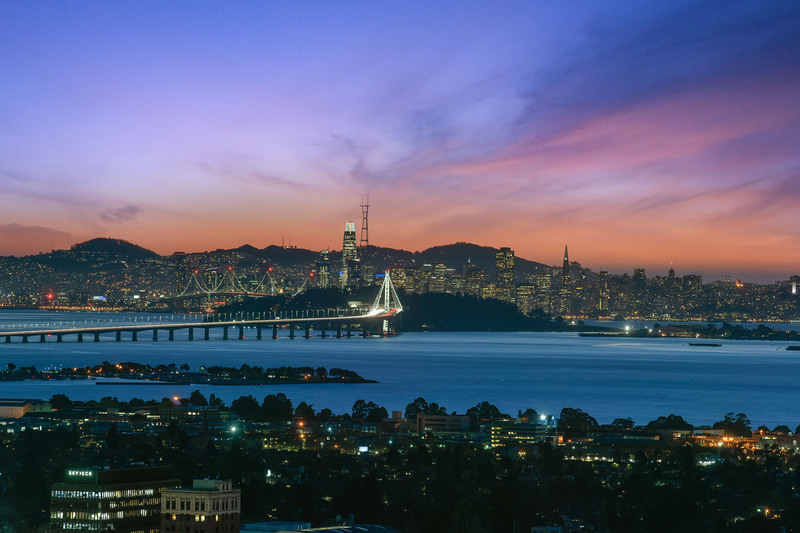 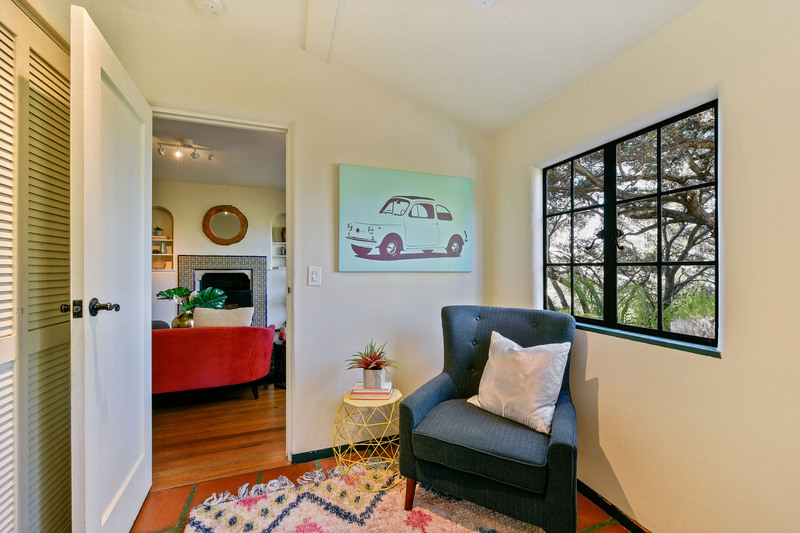 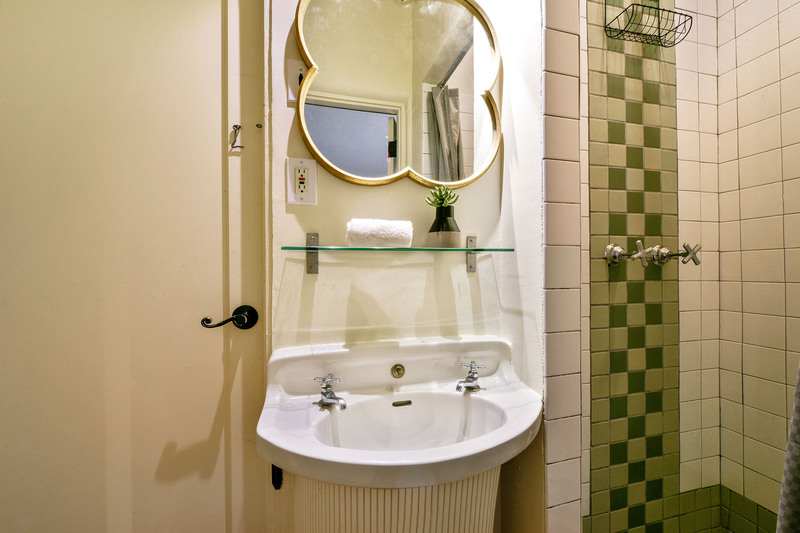 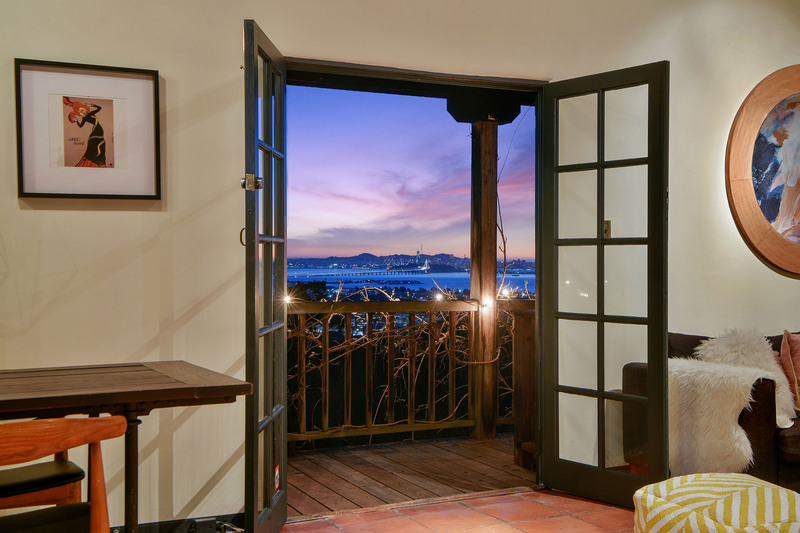 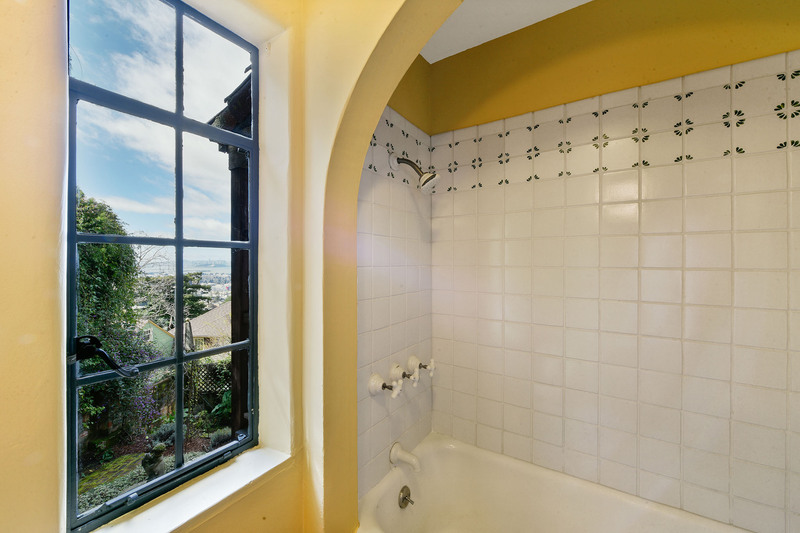 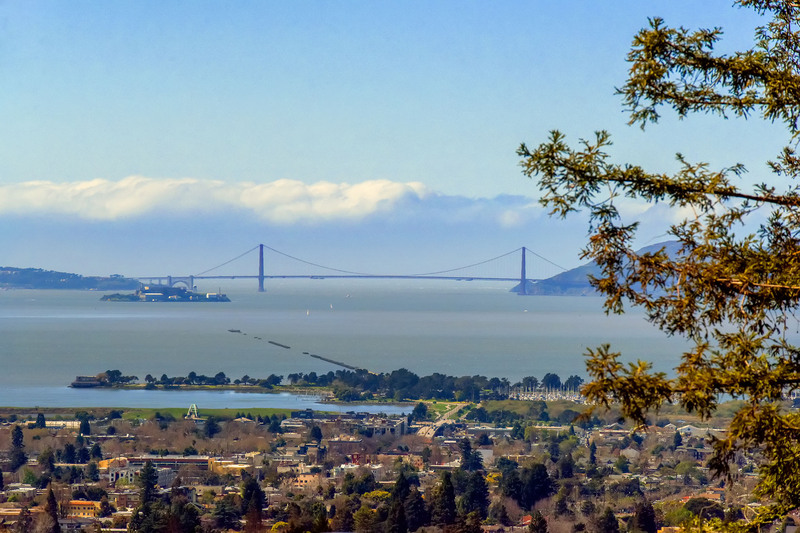 Accessible by a short flight of stairs is 2772 Hilgard’s owner’s suite, with a spacious bedroom with hardwood floors, views of San Francisco, Oakland, and the Bay Bridge through mullion windows, a walk-in closet, and a delightful bath with a shower over tub and a vintage aesthetic. 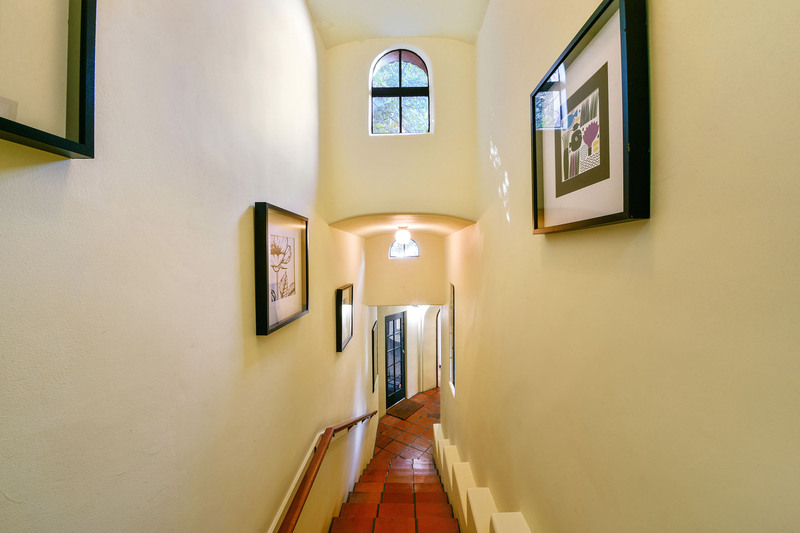 From the hallway off the bedroom, you can pass through to the first of the home’s separate apartments, built with a European cottage-like sensibility. 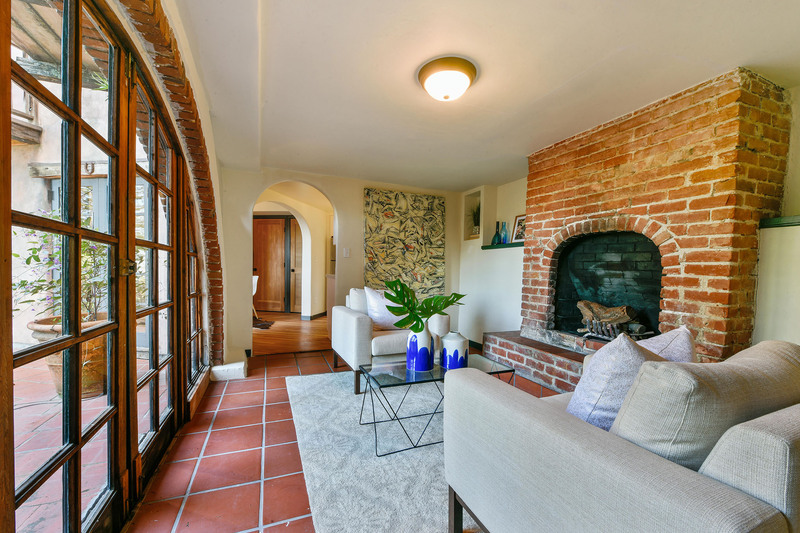 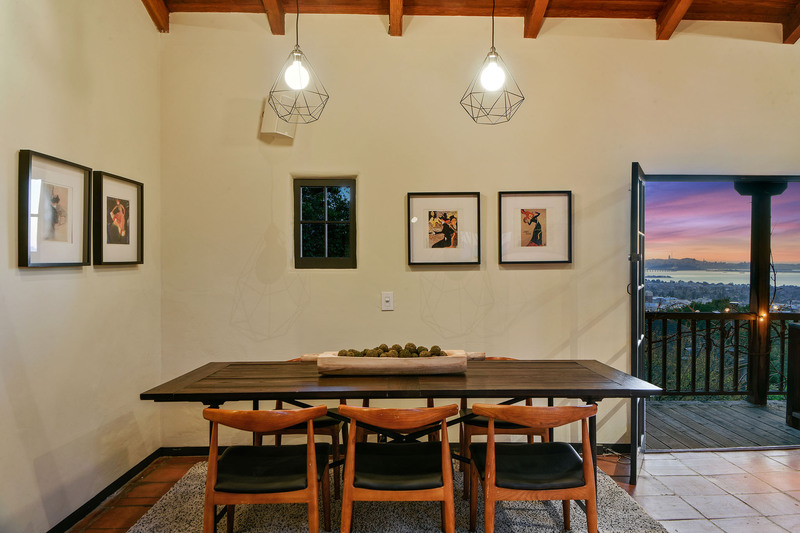 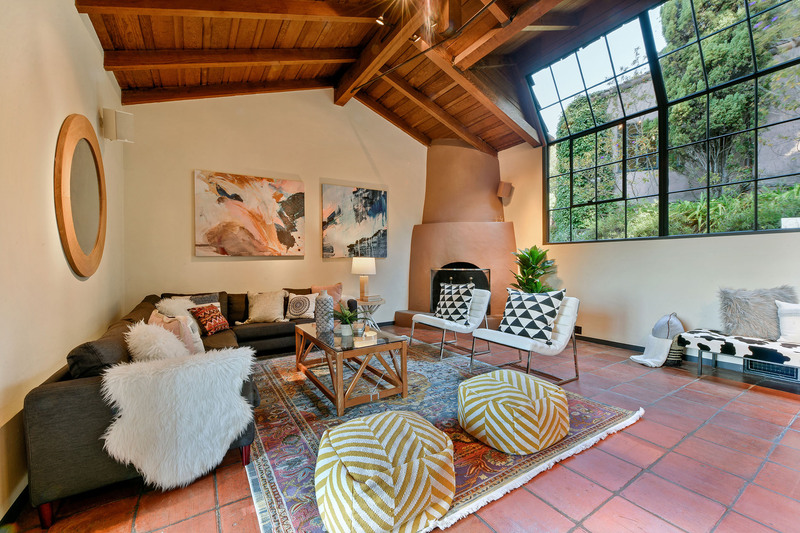 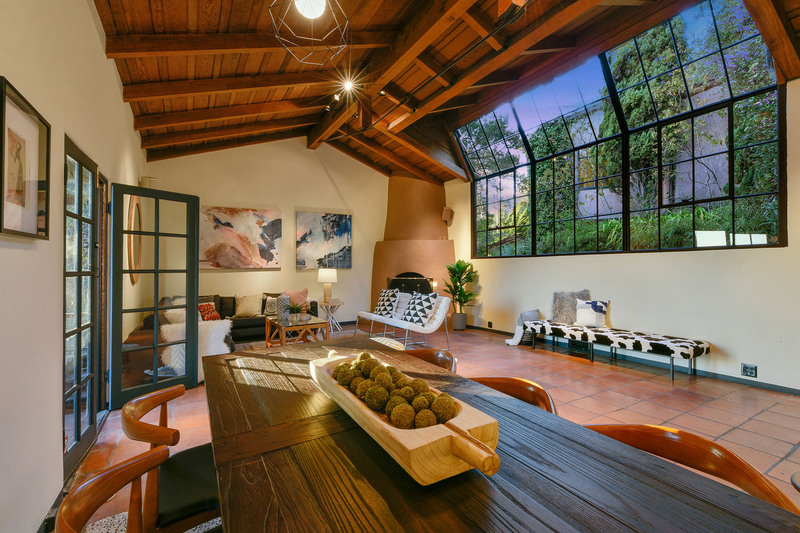 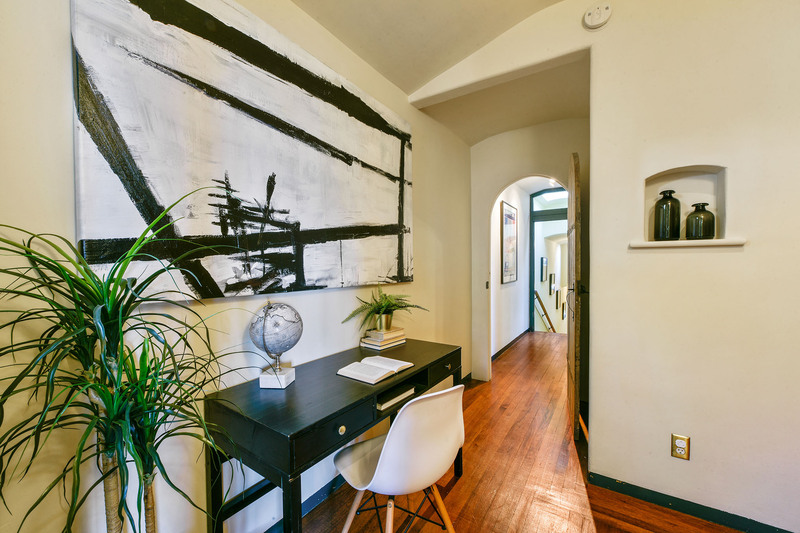 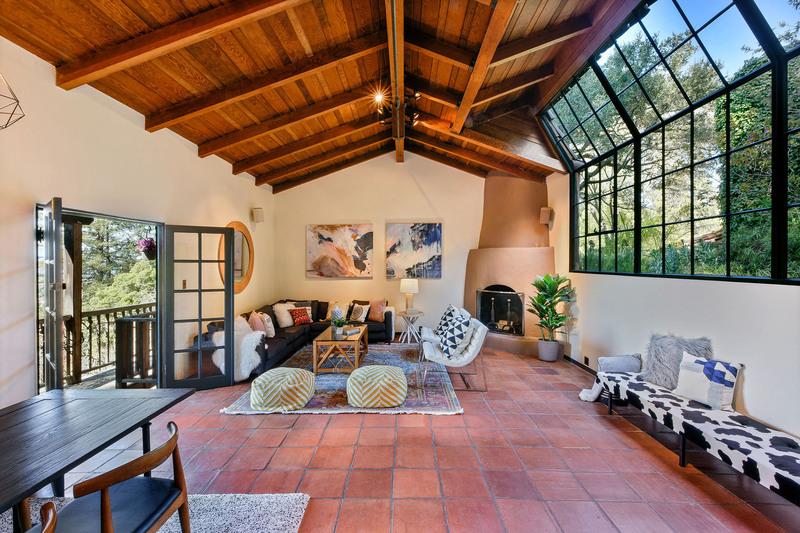 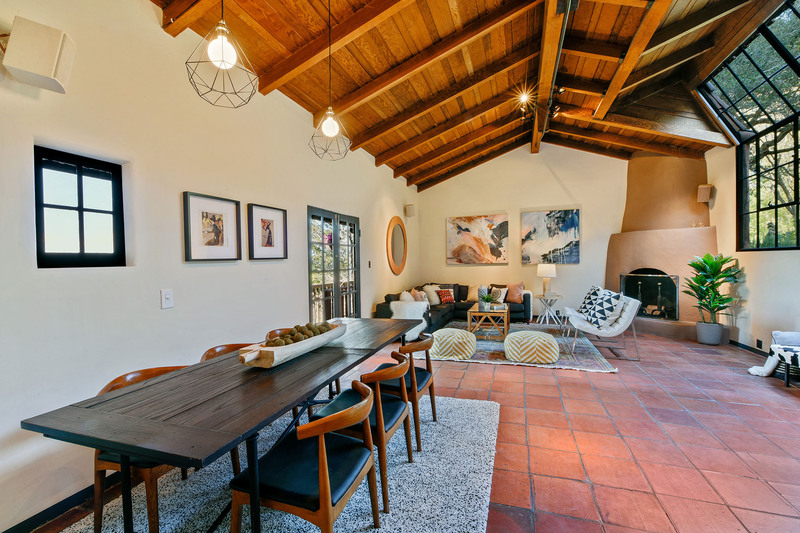 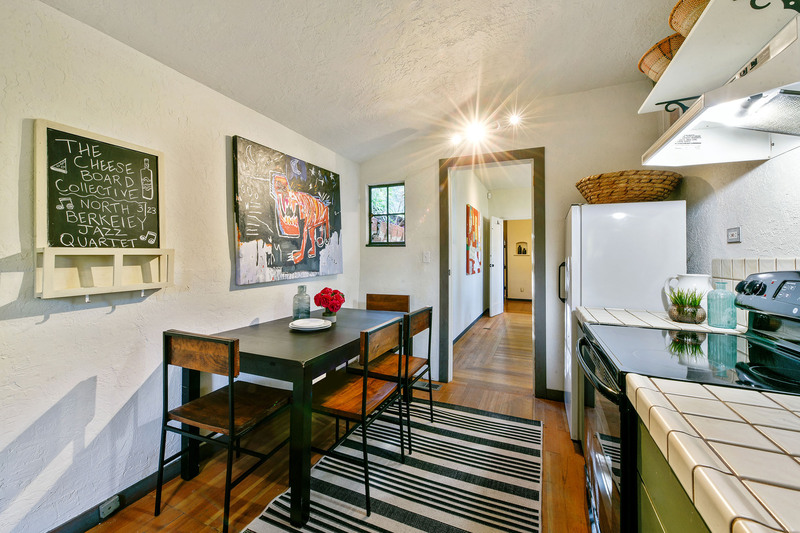 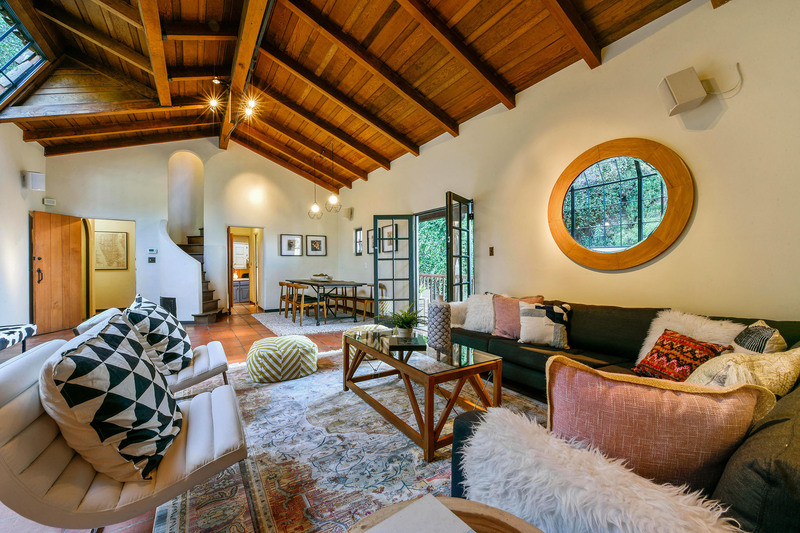 It has both hardwood and terra cotta tile floors, a living room with a fireplace accented with ceramic tile, an ingeniously designed full bath with shower, an eat-in kitchen, and its own delightful brick patio. 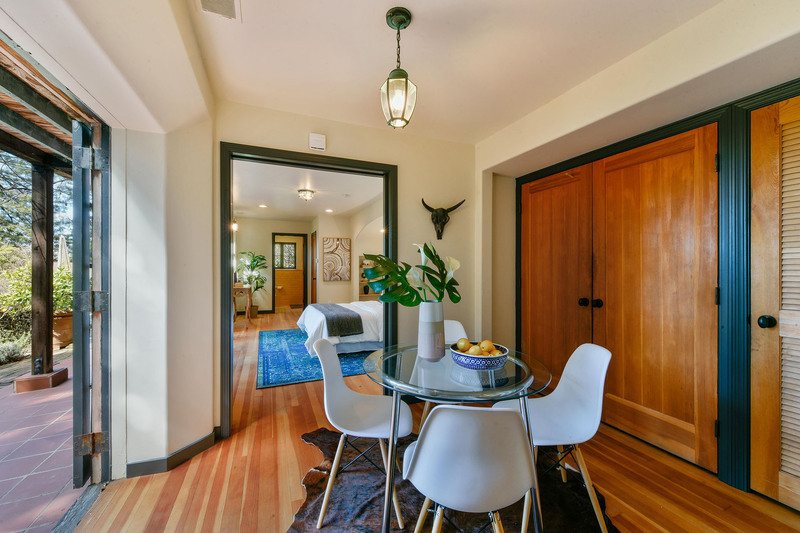 The upper apartment is incredibly versatile: because it is connected to the main home by a hallway, it can be either completely private or part of the flow of the main home. 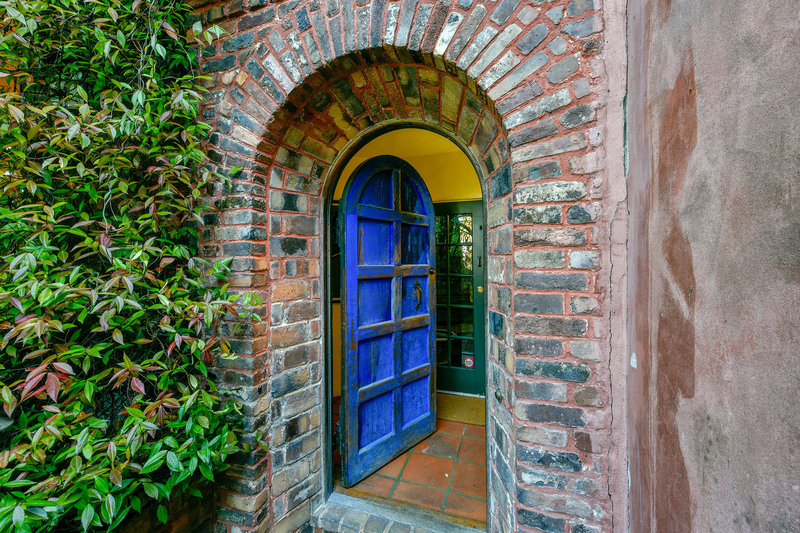 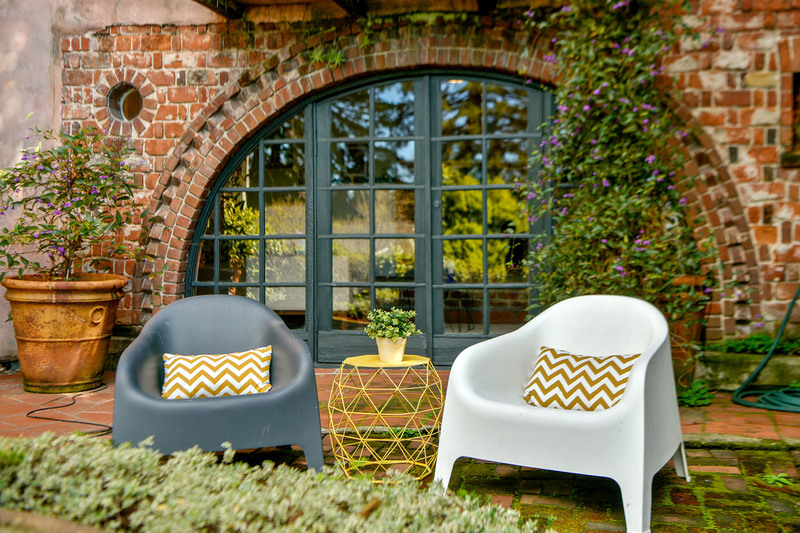 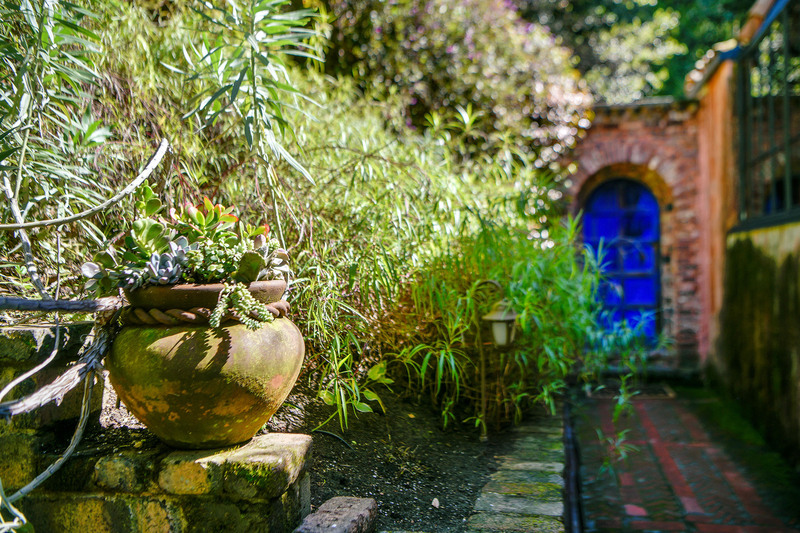 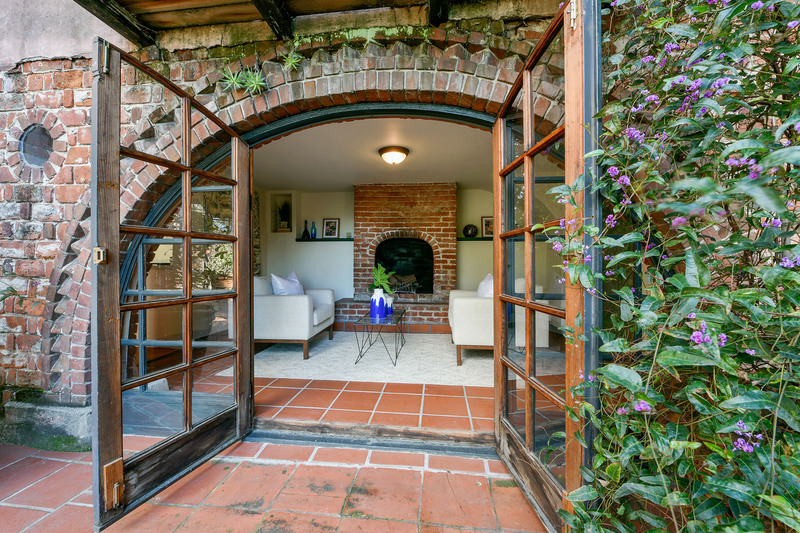 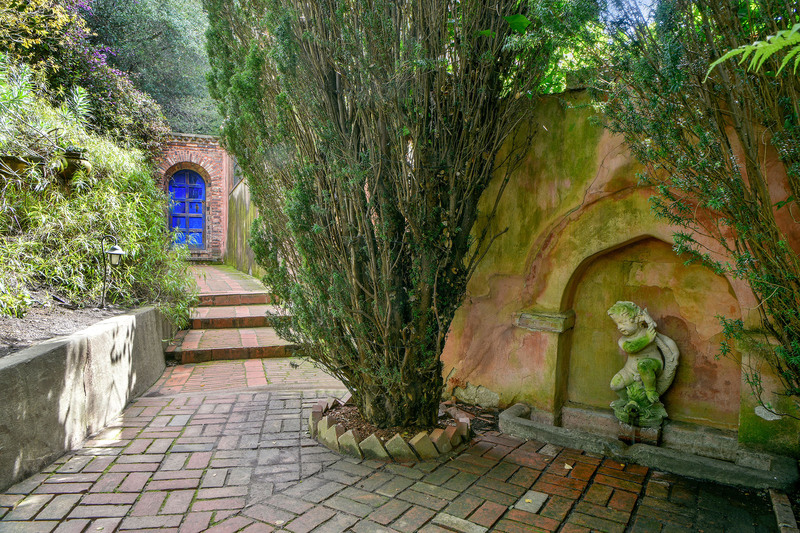 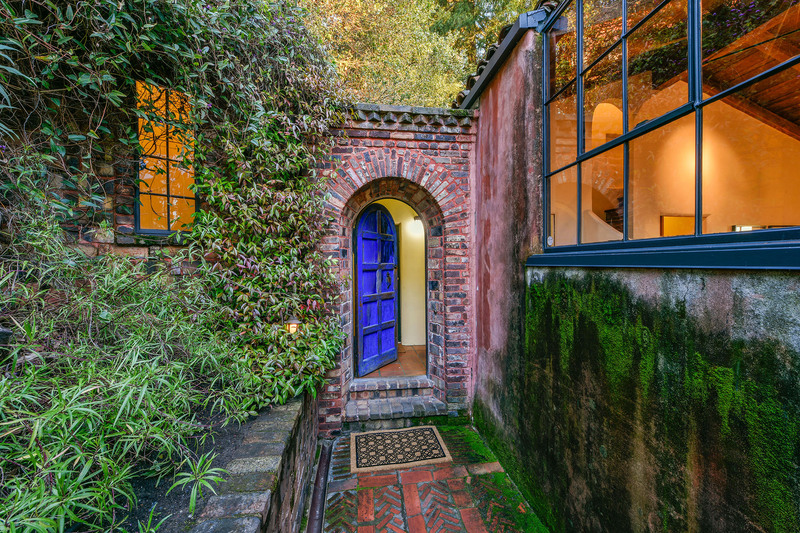 Pass through a gate from the home’s brick path and you will find its romantic terraced rear garden, which is exquisitely private and includes brick and terra cotta accents, a fountain, fruit trees, flowering vines that festoon the balcony, and views of San Francisco, the Golden Gate Bridge, and the eastern span of the Bay Bridge. 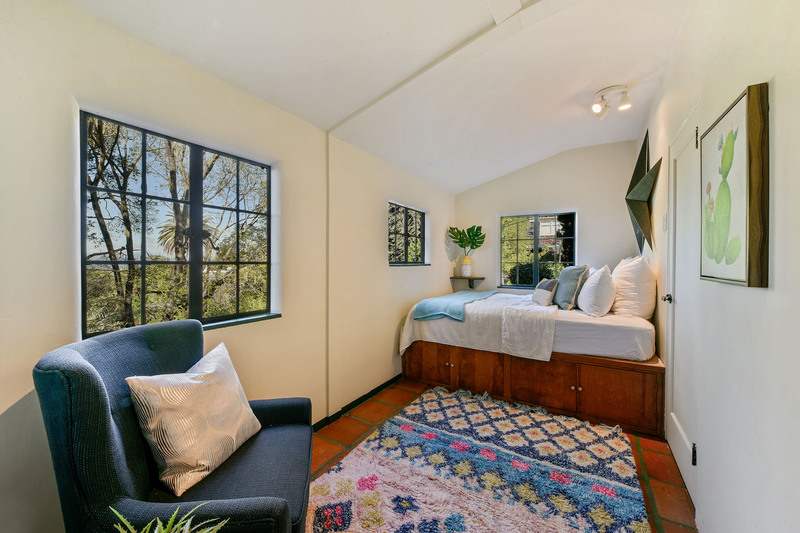 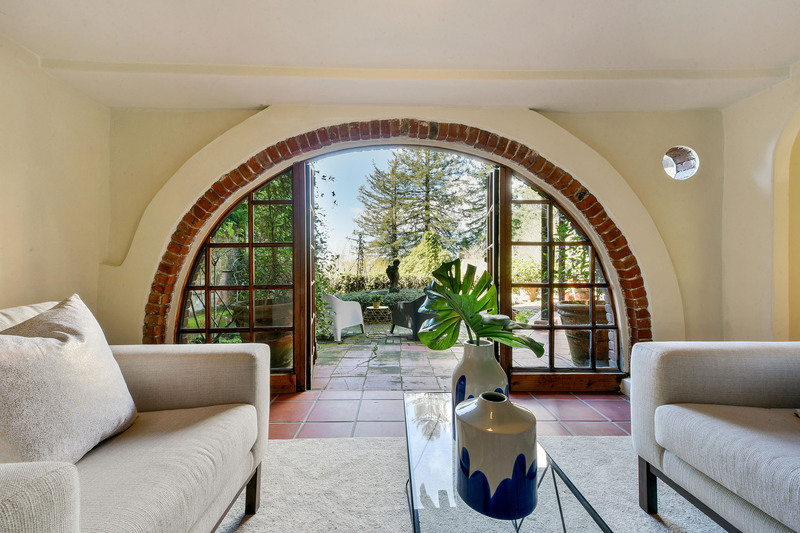 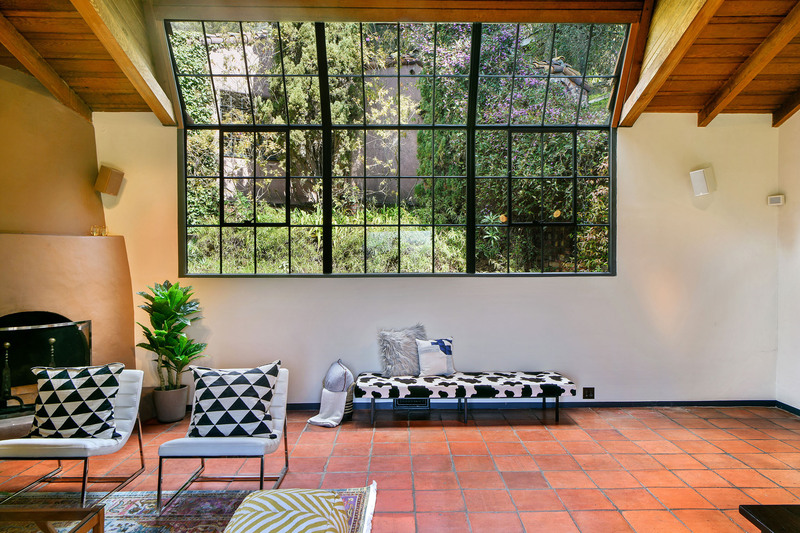 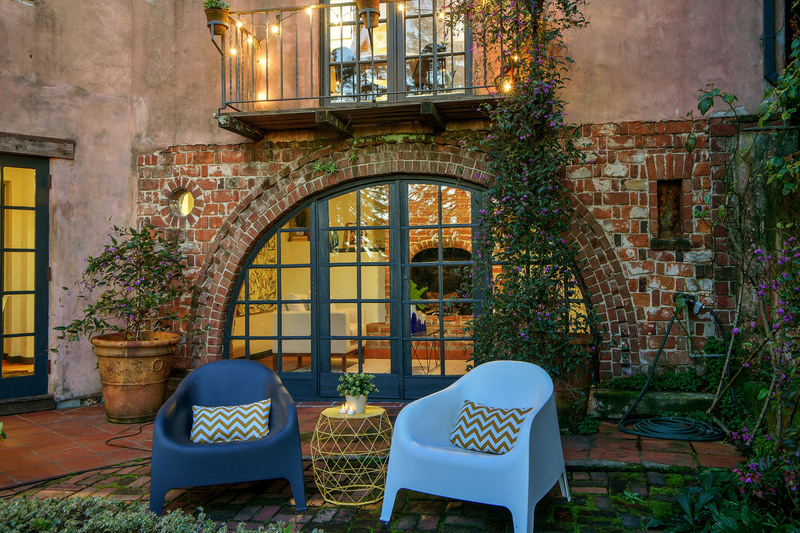 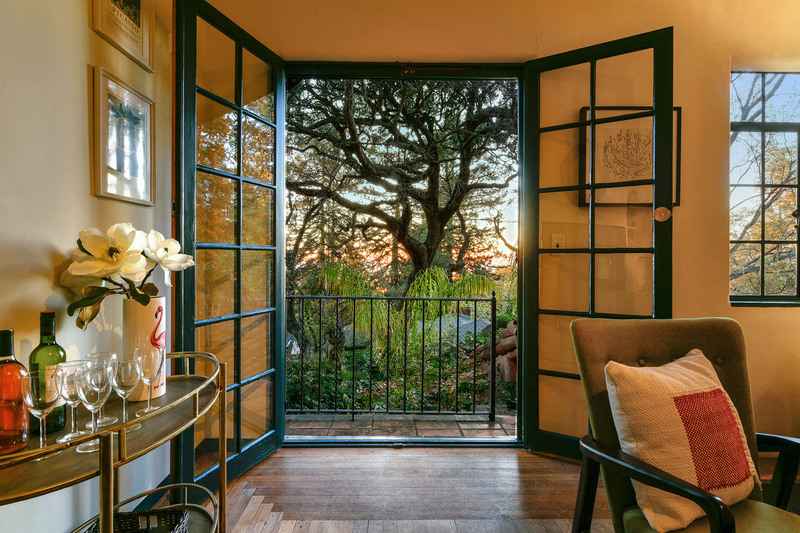 Accessible from the rear garden is 2772 Hilgard’s lower level apartment: three sets of French doors lead into this remarkable space, creating wonderful indoor-outdoor flow from every room. 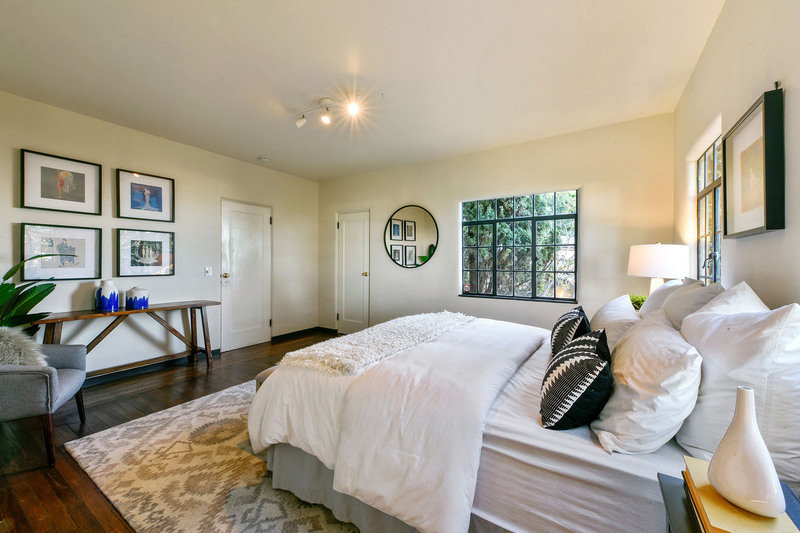 Within the apartment you will find a distinctive common area with a wood burning fireplace, a chef’s kitchen with sleek quartz countertops and gleaming stainless steel appliances (including a five-burner gas range), a spacious bedroom with with a walk-in closet, a charming bath with step-in shower, and a laundry area. 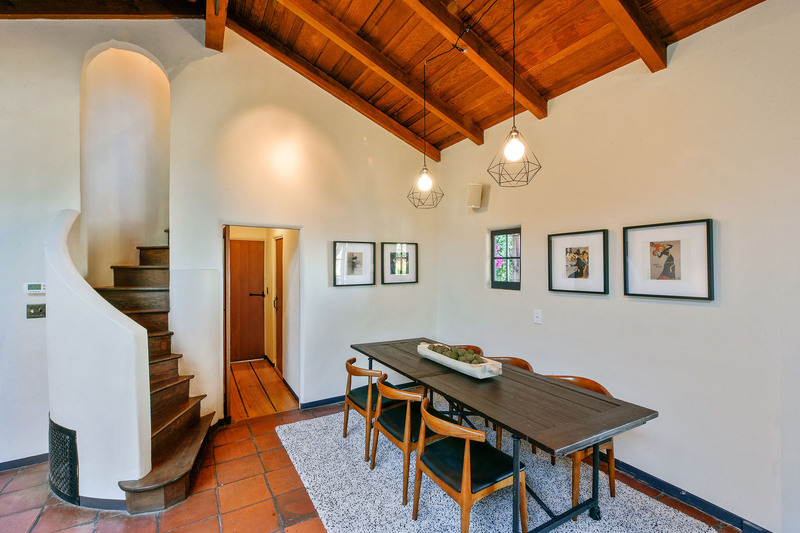 There are also stairs to the main part of the house, making this space incredibly versatile. 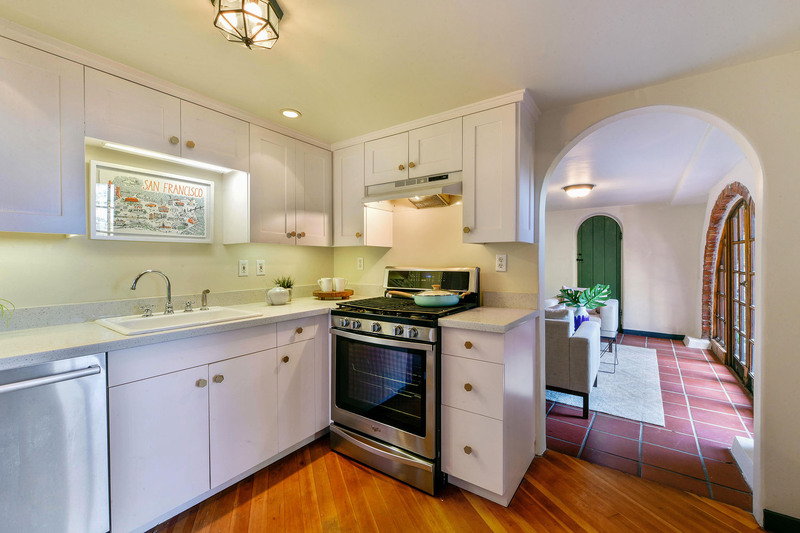 2772 Hilgard includes a two-car garage with external access.